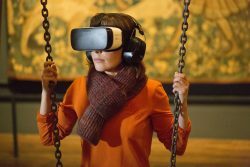 VR Playground follows Oscillate – a project which involved the creation of an immersive interactive artwork based on two popular entertainment technologies: the multi millennia-old rope swing and the 21st century VR headset – the former designed to excite the vestibular system, the latter designed to excite the visual cortex. VR Playground recently completed a national and international tour, funded by Horizon, the Mixed Reality Lab at the University of Nottingham, the Arts Council England, Norfolk and Norwich Festival, Greenwich and Dockland Festival and supported by Without Walls. During 17 days of continuous swinging around at the Norfolk and Norwich Festival in May 2017, over five thousand riders (ranging from 11 to 101 years old – able and disabled) were excited to perform to a combined audience of over ten thousand spectators.